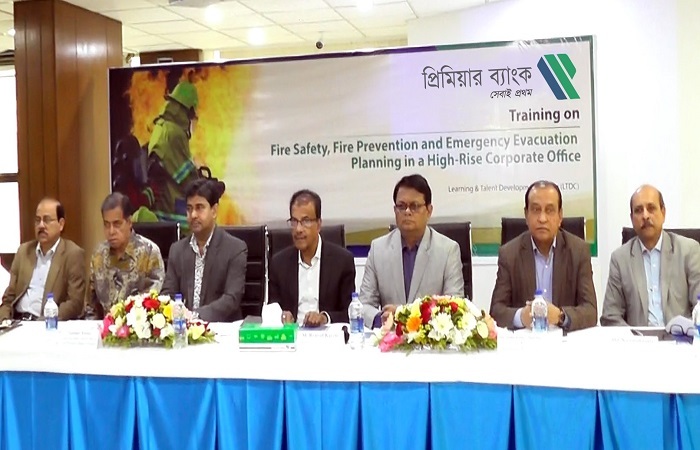 The Premier Bank Limited Learning & Talent Development Center has arranged a specialized Training on “Fire Safety, Fire Prevention and Emergency Evacuation Planning” at its Head Office. The specialized course was inaugurated by Mr. M. Reazul Karim, Managing Director & CEO of the bank as Chief Guest. The employees of the bank participated in the workshop. Golam Awlia, Additional Managing Director & CCO; Mr. Md. Abdul Jabber Chowdhury, Additional Managing Director & CBO; Mr. Abu Haniff Khan, Executive Director, SAMD; Mr. Ambassador Nazimullah Chowdhury, Consultant, Remittance Division; Mr. Md. Abdul Majid, Cheif Legal Counselor, Mr. Syed Nowsher Ali, DMD & Head of GSD; Mr. Md. Nazimuddoula, DMD & Chief HR Officer of the bank were also seen as the special guest at the session. The purpose of the workshop was to convey the importance & implications to fire safety, fire prevention and emergency evacuation planning in a high-rise corporate office.